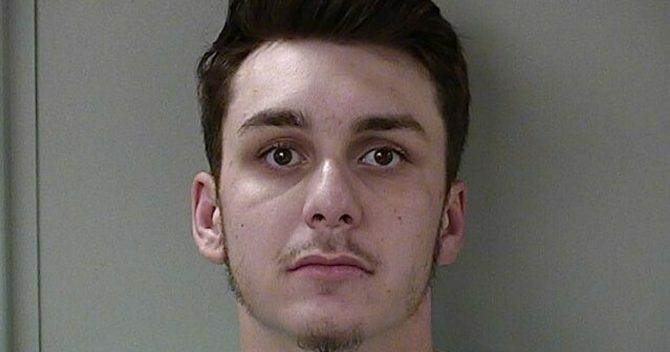 A Tennessee man has pleaded guilty to assault after attacking a gay man then bragging about it on social media. Last July, 24-year-old Brandon Wiley left a 39-year-old man with fractured eye sockets and a broken nose after a violent assault in MJ’s Bar & Grill in Murfreesboro, TN. The victim required an extensive hospital stay to treat his injuries. Following the attack, Wiley posted several photos of himself covered in blood and boasting about how he’d beaten a gay man for grabbing his crotch. When police questioned Wiley about the incident, he initially claimed that his victim “grabbed his junk and molested him.” Further investigation, however, revealed that Wiley lied about the attack. Both eyewitnesses and video footage reported that the man did not assault Wiley in any way. According to the victim, he did proposition Wiley, who responded with violence. Wiley pleaded guilty last week, with his sentencing scheduled for June 28. In the state of Tennessee, assault qualifies as a felony offense and carries a minimum prison sentence of three years. Another disturbed closeted gay guy. Any secure straight man would not have a problem with getting propositioned. This wasn’t just a simple assault This was anger and hate. This is the kind that you see in domestic violence assaults. Not to mention what was he doing outside of a gay bar in the first place? Notice how the goal of the anti-LGBT trolls is to divert the topic off of anything that makes bigots look bad? A bigot violently attacked a gay man because he’s a bigot. Oh don’t worry Rock… we, the gay mafia, have taken measures. You will probably never hear of this guy again. You were right all along. Our agenda is in full force, and I get a toaster for recruiting 24 people this week. That is 3+ people a day! Oh, and I was the secret third guy who attacked “Smurf”. My LGBT overlords commanded it of me and I obey. It’s not a gay bar. It’s mostly a restaurant (and judging from Yelp, not a very good one) – no indication online that it attracts much of a gay clientele. Usually gay bashers are closeted themselves and take that out on the “community” because they can’t cope with it. It’s really pathetic. I’m sure in 10 years time, he’ll have a boyfriend. HEY!! !…..He’s from Tennessee. What did you expect? Land of ignorant, intolerant, and bigoted fundamentalists. Same as Mississippi, Alabama, Kentucky and Texas. I feel sorry for the intelligent people that live in those states who have to put with all that stupidity. Ha. It is hilarious that you call into question an entire regions IQ when the use of such a broad generalization as this shows that you are not exactly hindered by a high IQ yourself. Seriously, did you put a moments thought into what you wrote? If so, that you missed the irony of it all is priceless. Hold the phone fur. I am from Texas and proud of it. Not everyone in red states is a knuckle dragging imbecile. We have a very large host of straight friends and advocates here in Dallas, and I am proud to call them my friends. May I suggest that you read Samatha Allen’s excellent book “Real Queer America, LGBT Stories from Red States.” I think it might change your mind a little about what it’s like to live gay in a place other than NYC or San Francisco. And you should also know, that we don’t “put up with” all that stupidity. We work hard and arduously to change it and wipe it out. I doesn’t help the cause when people like you make broad generalizations about places and situations you obviously know little about. He’s kinda sorta cute, more than likely gonna get what he was looking for in prison…..
Tennessee? He’ll probably get probation. They don’t like the queers down there.